February 14, 2016 - Savili has been sold. We standby for the new owner to check in. September 30, 2015. 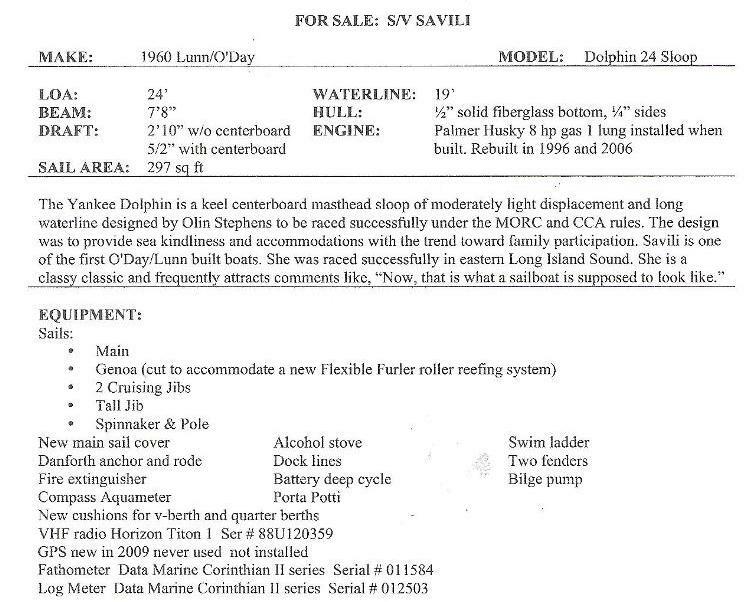 We got the following update from Mark Green on Savili's lower price and some nice comments on the Dolphin24.org website. I looked at the Dolphin for sale in Jonesport this past spring but decided to pass because I don't have the time right now. Just got a voicemail from the broker saying they have dropped the price to $3000 and are entertaining offers. The boat needs love but to my inexperienced eye would be a fun and rewarding project. In doing my research on the Dolphin I found your web site so I thought I would pass this information along. Thanks for taking the time to create and update this web site. July 24, 2015. 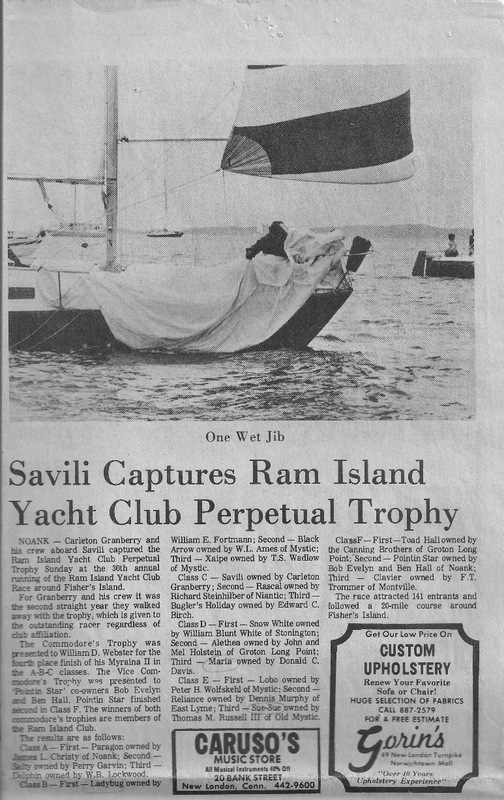 Savili is still FOR SALE at Jonesport Shipyard, Maine. Click here to go there. Also, Click here to see a PDF with offering spec - also see comments from Kim Granberry whose dad Carleton was a former owner of Savili at the bottom of this page. June 29, 2014. 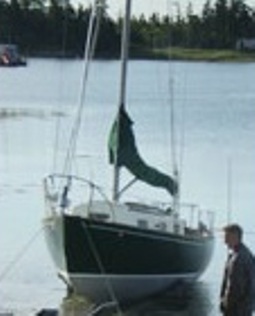 Savili is still FOR SALE at Jonesport Shipyard, Maine - advertised in Points East Magazine, July Issue, $4500 OBO. Click here to go there. 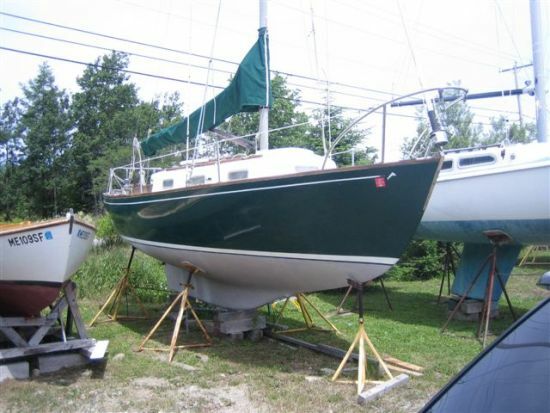 December 9, 2013 There an update on Savili's listing at Jonesport Shipyard in Jonesport, Maine. Click here to go there. This is an update on Savili's listing at Jonesport Shipyard in Jonesport, Maine. 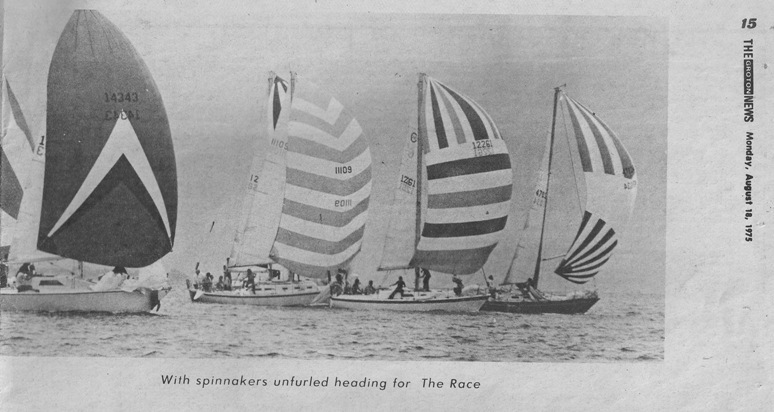 Savlli is one of first O'Day/Lunn Laminate built boats, and certainly one of the boats that established the Dolphin's outstanding reputation as a small racing auxiliary. As En Charette she was raced successfully in eastern Long Island Sound by Ron Noe of Essex, CT. Ron bought her from Hugo Hilderdorf of Patchogue, LI, NY who Ron believes was her first owner. She was a stripped out boat below and Ron built out the interior to keep weight as low as possible. She had a white hull and a Palmer 8hp inboard. Webmaster Note: The hull numbering system that O'Day instructed Lunn to use was to start their series with 200. So, if correct, Savili is Lunn hull #1. Except, we have a report from Bob Larson, an early investor in O'Day, and US Yacht, the company that marketed and sold the Dolphin 24 starting in early 1961, indicating that he delivered the first Lunn built boat to a customer in New Jersey...So, we will have to live with Savili as 'one of the first' Lunn built boats, pending further information. For more on this click here. Dear Jim Just learned about the site and couldn't wait to log on. After years of sailing an O'Day Javelin and crewing on other people's bigger boats, two summers ago I bought hull # 200 built by Lunn in 1960. I absolutely love the boat. Her name is Savili, a name I inherited. It’s a Samoan word meaning "fresh breeze." She looks exactly what a sailboat is supposed to look like and sails like a dream. 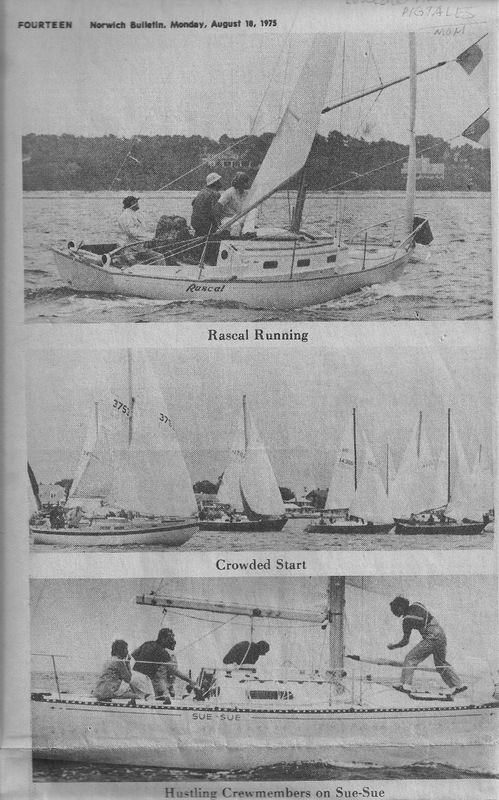 She was raced a lot in Fisher's Island Sound in Connecticut and always did very well in the Block Island race scene. I keep her in Jonesport, Maine which is way downeast and in the summer she is moored on the Western shore of Great Wass Island. She has a very different cabin layout from some of the pictures of other Dolphins I have seen. I would like to reconfigure and get the Porta-Potti out from under the table! She still has the original engine which is an eight hp Palmer gasoline. It runs like a charm but I am thinking of going with a small diesel but not until I do lots of other stuff. My first priority is some deck leaks which I will tackle next spring. Please sign me up for any memberships and let me know what I owe or whatever. Gary DeLong, Bar Harbor, Maine. Webmaster Note: January 29, 2008 - we have tracked down Gary and expect an update and pictures of Savili soon. 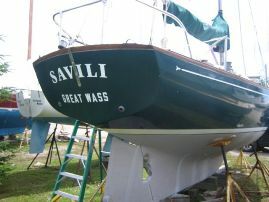 Savili is going in the water later this week. I have had her little one lunger original 8 hp Palmer inboard rebuilt this winter and finally got it back in and all put back together. I decided not to go the diesel route. Too expensive plus I hated to get rid of the Palmer. But with all the messing around the engine I didn't get some other aesthetics taken care of. I didn't get off the "hard" last summer so I am determined to get her in before the summer is gone. She will be on our mooring on Great Wass Island in the town of Beals. As soon as I get her in I will get some new digital photos and get one sent to you. I love hearing about other Dolphins so really appreciate you keeping in touch with everyone. In addition to a photo. July 22, 2008. Gary sent in the pictures at the top of the page, and the following picture of Savili's nameplate. When O'Day contracted with Lunn to build 25 boats in late 1960 they instructed Lunn to assign hull numbers starting with 200. If this is correct then Savili is their first boat. 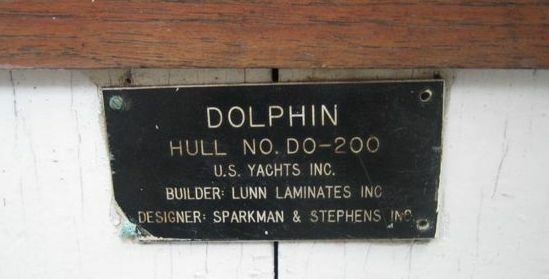 US Yachts (click here to go to US Yachts) was O'Day's marketing and sales agent for the Dolphin - it is curious that O'Day's name does not appear on the nameplate. For more on nameplates and builder's numbers, click here. February 9, 2010. 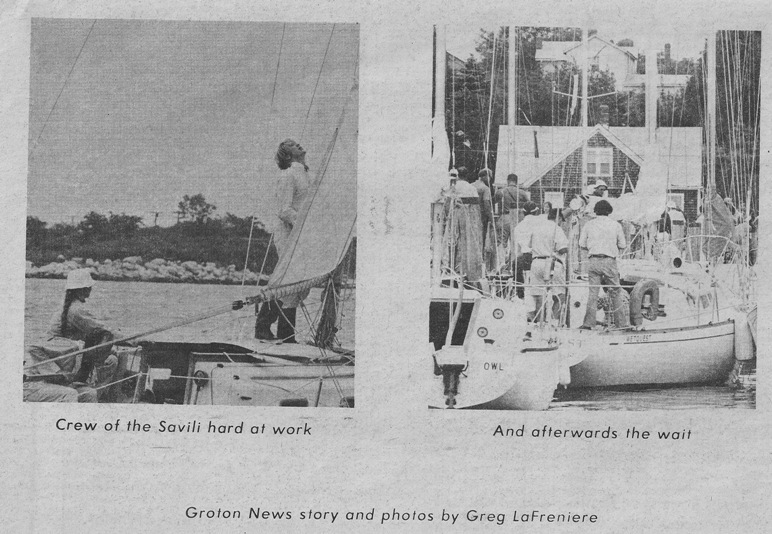 A co worker of Gary's sent in a copy of a photo of Gary receiving a half model of his Savili built by Eric Sandberg in Isleboro, Maine. 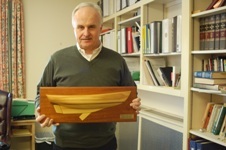 It was presented to him by his co-workers and staff at the Seacoast Mission in Bar Harbor. Click here to go to our models page - there you will see a large photo of this half model and information about the builder. In his summer cruise to Maine of 2008 your webmaster had an opportunity to meet Gary in Bass Harbor. How this happened is part of an interesting side story. Click here to go there. I just bought my son his first Optimist and was looking up my dad’s old boats. I can’t tell you how delighted I was to find Savili in good shape and well-loved. My father (Robert) owned her between Carl (Carlton Granberry) and Ed Diekerdorf from about 1979 to 1981 and also sailed her out of Sachem’s Head. I’ll be in Bar Harbor this summer and will be sure to look her up! I can’t believe the original Palmer is still running! It barely worked in 1979!!! Your website is the best website I have ever visited, and I visit a lot. I have been following your's for years as a confirmed Dolphinaholic. On this year's cruise, which took us to Maine, I went further East to visit Savili in Jonesport. She is structurally and mechanically sound and the engine had been run the day before we arrived. She's ready to go anywhere and Gary has done numerous value added improvements, but she does need a cosmetic make over. As a result of your comprehensive website work, I have been able to educate myself on trailers, the different manufacturers etc. etc. I have been able to locate and research Elizabeth and as a Lunn Laminate fan; find Nalina right in my back yard. I put a deposit on her from Maine with the miracle of the cel phone and will be taking stewardship when I get home August 1st. A man with out a Dolphin is like a man without a country, and I feel like a mariner who has returned to homeport. This has all been due to your commitment and service to a beautiful and endearing little vessel. My sincerest thanks, all my best and looking forward to seeing you afloat on sister ships. postscript: Between mentions of Ram Island and Off Soundings I think the website pretty well covers the Glory Days of our racing career. Ronnie (Noe) sure did well before us. Ed Dieferhoff won an Off Soundings after us. There was a fast Wanderer, (Jack Saxe) some Tartans and Morgans, (Bill Drinkuth and Bill Loweth) but Marionette, Savili and the rest of the Dolphins pretty much dominated the class for decades. And congratulations to Marionette this year, you're running with the Big Dogs now. More often then not the handicapping is usually not advantageous to the smaller boats on the longer courses. Plus as most know Savili's history goes back to Ronnie Noe's Encharette - she started as a Lunn Laminates boat with Ron lowering the center of gravity by lowering the cabinetry and adding that weight saved back in the bilge as lead pigs, not 200 lbs, and not 250, somewhere in the middle. John, I have a tube of drawings and a substantial file that I'll be happy to forward to you. Even if you don't plan to race, it may interest a future owner. These boats still sail well under PHRF and this one has a fairly accomplished life time record. Such pleasure to sit in front of the fire at 15 degrees and think about such things. Will be back to you both. 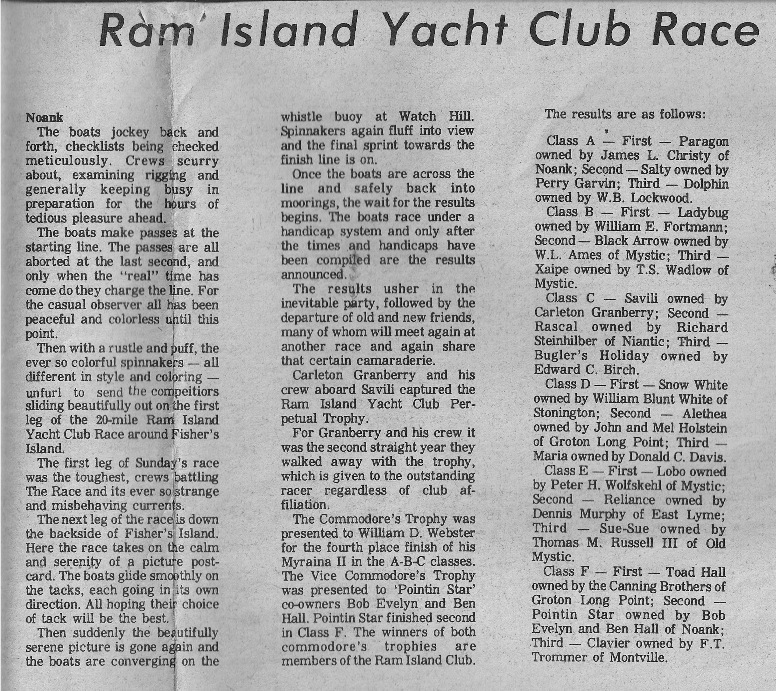 Webmaster Note: Senior DFI Mark Steinhilber, a marine architect, and a crew on his dad's Rascal, had the "good fortune' to race against Savili. Years ago he gave us a technical report on the 'climbing centerboard' - its in our Technical Section/ Centerboards. Click here to go there. A good read!